California-based Preservation Partners recently purchased St. Andrews Court and Coventry Court apartments after the Washington State Housing Finance Commission authorized more than $12 million in tax-exempt revenue bonds dedicated to the purchase and improvements. St. Andrews Court is a three-building, 81-unit complex near the intersection of Indiana Avenue and Post Street. The building at 808 W. Nora Ave. will receive $1 million in improvements; the building at 811 W. Indiana Ave. will get $800,000; and the structure at 1815 N. Post St. will receive $1 million. Another building recently purchased by the California group is in Browne’s Addition. Coventry Court, 1600 W. Pacific. St., has 87 units and will see $2.1 million in improvements. Both complexes are primarily low-income housing for seniors and are Section 8 housing, meaning part of tenant rent is paid for through a government voucher program. The buildings were purchased by Spokane 2 Preservation, an affiliate of Torrance, California-based Preservation Partners Management Group, which specializes in low-income housing for seniors. The company this year received $35 million in tax-exempt bond financing from the state housing commission for the complete renovation of Trailside Village Apartments in Everett, which is Section 8 housing with 250 units. Before the purchase, Kiemle & Hagood managed the properties. Shannon Meagher, director of development and special projects for Kiemle & Hagood, said they will no longer manage the complex. According to documents filed with the city of Spokane, the improvement work will replace windows, cabinets, countertops, lighting, plumbing and mechanical items. The project’s general contractor is Square Top Construction, based in La Mesa, California. SMR Architects, of Seattle, designed the project. Structural engineering is being done by Spokane-based Coffman Engineers. A three-story apartment building that caught fire last year, leading to the deaths of two people and the hospitalization of a firefighter with severe burns, is being repaired for $2.4 million, according to city permit records. The Rosewood Club Apartments, 401 E. Magnesium Road, was the location of a two-alarm fire in September 2016 that spread rapidly, according to reports. The woman who died was bedridden and used oxygen, and the man cared for her full time. The fire’s intensity likely caused the oxygen to explode. The nearly 16,000-square-foot, 24-unit apartment complex, built in 1977, is owned by Rosewood Club Associates LLC, of Aurora, Colorado, which purchased the building in 2001 for $2.6 million. County tax records list the property’s value at nearly $6.1 million. General contractor for the repair work is Building Resources Inc., of Garden City, Idaho. Kilburn Architects, of Seattle, did the design. Kirkland-based Dibble Engineers did the structural engineering. The demolition of a historic building in downtown Spokane has started, preparing the property and adjoining building for an estimated $1 million in improvements, according to city permit records. The 110-year-old building being torn down at 119 S. Stevens St. was built in 1907 and housed an early grocery wholesale distributor, the McClintock-Trunkey Co.
Cody Coombs, who owns the building, plans to renovate an adjoining historic building into office space, according to documents filed with the city. 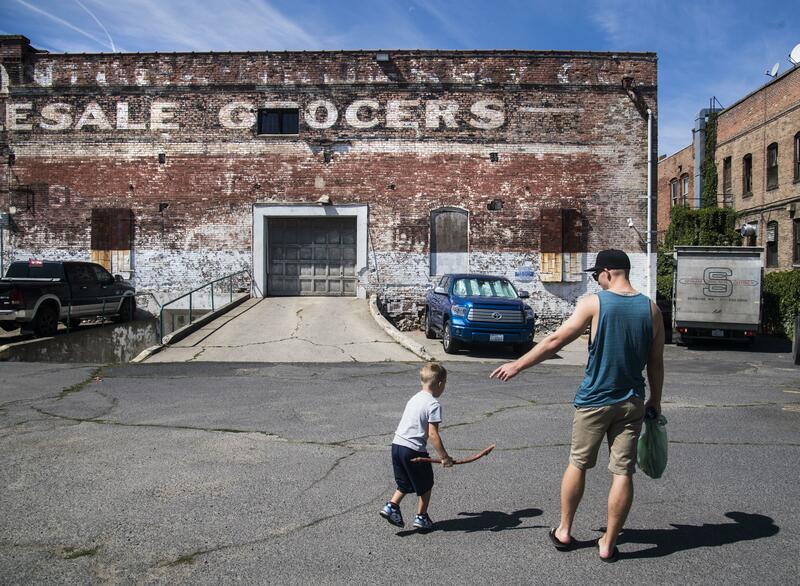 The two-story, 17,000-square-foot grocery building, which has been used as a parking garage for almost seven decades, will be torn down and replaced with a 57-stall parking lot. The remaining five-story building, which abuts the BNSF Railway viaduct, is 6,000 square feet. The existing building will be mixed-use, primarily office space. According to county parcel data, the Stevens property was purchased in July 2015 for $1.2 million by Evergreen Parking & Warehouse LLC, which Coombs owns. Coombs is part of a father-son development team that has been active in Spokane’s neighborhood centers. In 2016, they took down a house just off South Perry Street with plans to build and lease a parking lot to the city of Spokane for an estimated $55,000 a year. The lot remains vacant and undeveloped. In 2013, the Coombs built the building occupied by Perry Street Brewing. They also renovated the East Sprague Avenue building where Bennidito’s Pizza opened a second location in 2014. Dave Coombs, Cody’s father, owned the downtown Honda and Toyota dealerships before selling them in 2009 to focus on real estate. Garco Construction, of Spokane, is the project’s general contractor. Clay Conrad, with Garco, is the architect. Bob Green, also of Spokane, did the structural engineering. Published: Nov. 5, 2017, 6 a.m.